Painting your house from top to bottom? The best Farrow & Ball paint colours are all you need. Find out more about how to paint a house with our handy step-by-step guide. If you're looking for a bargain, head to our best paint deals page. What makes Farrow & Ball's paints so popular? Farrow & Ball's best-selling wall paints are available in three finishes: Estate Emulsion (chalky matt), Modern Emulsion (matt), and Full Gloss. They also do an Eggshell that is perfect for wood and floors, plus Exterior Masonry and Eggshell finishes. Look out for low sheen Specialist Finishes, too. The timeless elegance of this classic just off-white shade has made it a firm favourite for many years. A versatile choice for almost any room – particularly one you want to feel light and bright – the merest touch of warm yellow pigment makes it a more inviting shade than bright white. Shown below as a living room option. The best Farrow & Ball paint colour for a white option, we think! 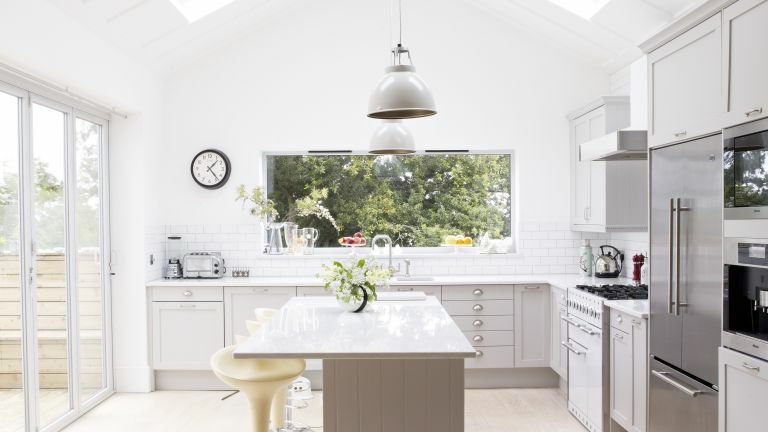 Browse white kitchen ideas and white living room design ideas to inspire your scheme. Grey isn't going anywhere! An enduringly popular choice for stylish bedrooms and living rooms, it is an easy way to create a tranquil and inviting atmosphere. Skimming Stone is a rich, warm grey - neutral enough for any room, but with a distinctive edge. Pair up with Wimborne White to create a luxurious neutral bathroom, as shown below. Browse grey living room and grey bedroom design ideas to inspire your schemes. Farrow & Ball describe this colour as 'a dramatic lead grey' – the best Farrow & Ball paint colour option for making a statement in the hallway or bedroom (as shown below), but now finding its way into living rooms, home offices and dining spaces, too. Deep, dark grey-black has been an on-trend colour for quite a few years now and shows no sign of going out of fashion. A characterful alternative to light neutrals, it works brilliantly combined with off-whites or pastels. Browse dark and atmospheric room design ideas to inspire your scheme. Blue or black? Why choose if you can have a colour that occupies a perfectly balanced space in the middle? With its unique, rich tone, it is no wonder that this shade has become a bestseller. This colour works especially well for adding character to a study or dining room, as shown here. Why not use it on woodwork and doors, too, to up the contemporary appeal? We think this is the best Farrow & Ball paint for those looking for a dark option. A bold and dramatic shade, Stiffkey Blue works wonders on rooms that are often overlooked, such as dining rooms and pantries – but don't overlook its potential for a bathroom or kitchen, too. Consider using it as an all-over colour for a really striking effect, as shown below. We think this is the best Farrow & Ball paint colour for those wanting a darker striking effect. A delicate duck egg shade, Dix Blue sits somewhere between blue and green. A great option for injecting any room with a dash of summery, light-hearted colour, it has a touch of black pigment that creates a slightly aged and relaxed vintage feel, making it perfect for use on upcycled furniture, panelling and woodwork, as well as living room walls. Pair it with a neutral shade, such as Pointing, for an understated effect, as shown here. A very popular choice for shadier spaces, Light Blue has a shimmering, silvery quality that will add interest to rooms with a light quality that may otherwise look flat, especially if they are north-facing. It also works well for contrast painting the inside of a cloakroom or cupboard. Shown here (cupboard interior) paired with All White. A popular colour choice, and not just for walls, a splash of mustard shouldn't go amiss in your home come spring-summer time. It'll certainly grab your guests' attention, and it works wonders in naturally dark rooms. Whether you're thinking of using it for a feature wall, to jazz up your flooring or revive some old-looking furniture, it's a daring choice we think you'd love. The best Farrow & Ball paint colour for those looking to step out of their comfort zone.